Two portraits of Charles I’s eldest children - the eleven year- old Prince of Wales, (later King Charles II), and his nine year- old sister Mary, the Princess Royal, (later, the mother of the future king, William III) will be among the highlight s of Sotheby’s London Old Master Evening sale on 5 December. Among the very last works that Van Dyck painted for his royal patron, these charming, beautifully preserved portraits have been in the same private collection for nearly a century, and come fresh to market with a combined estimate of £2.6 million – 3.8 mil lion. Conceived and executed in the summer of 1641, months before the artist’ s death in December the same year, it is possible that they are the portraits of the Prince and the Princess recorded as being among the possession s left in the artist’s studio in Blackfriars on his death. Epitomising the extraordinary skill which V an Dyck brought to child portraiture, a genre in which he had excelled ever since his early years in Genoa, both works provide a penetrating likeness of the royal children at a time when their world , and the Stuart monarchy , was on the brink of collapse. 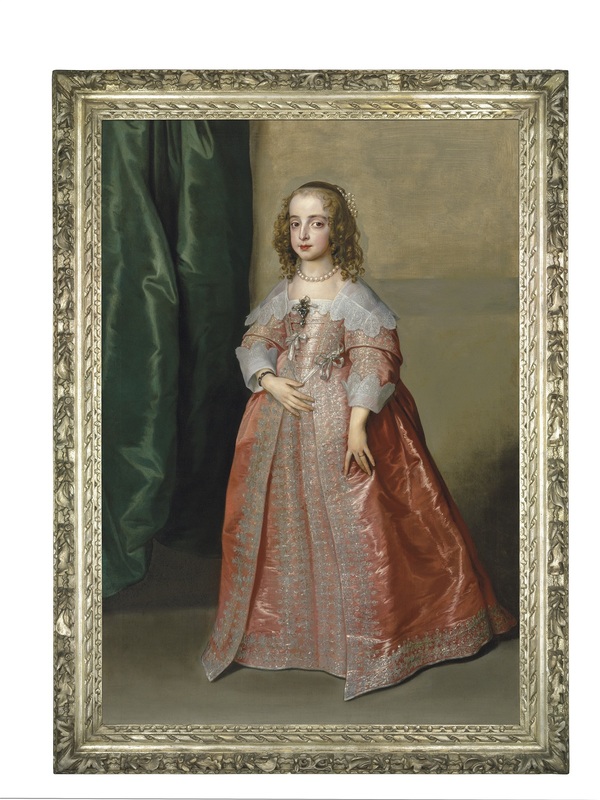 Alex Bell, Sotheby’s Co -Chairman of Old Master Paintings , said: “ Van Dyck was responsible for creating the enduring image s of Charles I and his court, and in these exceptionally well -pre served portraits of his two eldest children we see the artist use his painterly skill to acknowledge both the youth and the status of his royal subjects. The tumultuous history of the Stuart court has always captured people’s imagination and with the addit ional interest sparked by the fascinating exhibitions in London this year, it is particularly timely for these royal portraits, which are extremely rare to the market, to come up for sale.’ Appointed ‘Principal Painter in Ordinary to Their Majesties ’ in 1632, Van Dyck created numerous portraits of Charles I, his wife Henrietta Maria, and their children, many of which still remain in the British Royal Collection. Depicting his sitters with a relaxed elega nce and understated authority, V an Dyck ’s sophisticated style d ominated English portraiture until t he end of the 18 th century. Portraying the eldest child of Charles I , the Portrait of Charles II, when Prince of Wales (estimate: £2- 3 million) is a unique likeness of the young prince and one of t he finest royal portraits of Van Dyck’s late career. Depicting the future heir to the throne standing in armour with the ribbon of the Garter, with his left hand resting on the hilt of his sword and his right on the head of a stick, this portrait mark s a d istinct shift in the representation of the young Prince. Moving away from the celebrated child portraits painted alongside his siblings, th e portrait exudes a more martial and adult gravitas , both in accoutrements and bearing. 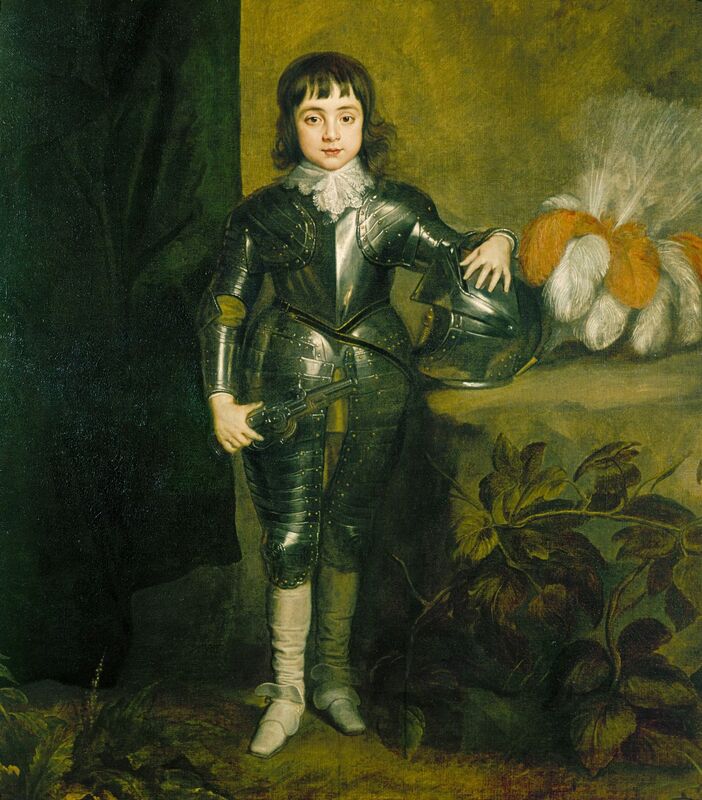 Although he was still very young, the Prince of Wales accompanied his father, Charles I, at the outbreak of the English Civil War, and was present at the battle of Edgehill in 1642. When by 1646 it was clear that his father was losing the war, Charles was made to flee England and take refuge on the continent. Following the king’s execution, Charles lead a number of unsuccessful campaigns to recover his throne. Following the death of Oliver Cromwell in 1658 and the reformed parliament’s decision to restore the monarchy, Charles returned to England in 1660 as King Charles II. Painted shortly after her marriage to Prince Willem of Orange, the Portrait of Mary, Princess Royal and Princess of Orange (estimate: £600,000 – 800,000), is the last of the artist’s likenesses of the young princess. t is one of three versions of the design , all most likely to have been painted in the summer of 1641. Mary is depicted wearing a fine orange silk dre ss edged with lace tied with blue ribb on, and both her wedding ring and the large diamond brooch given to her by her husband the day after their wedding on 2 April 1641. By this date Van Dyck was probably too unwell to finish the picture himself for it seems probable the painting of the Princess’ costume was entrusted to his studio. 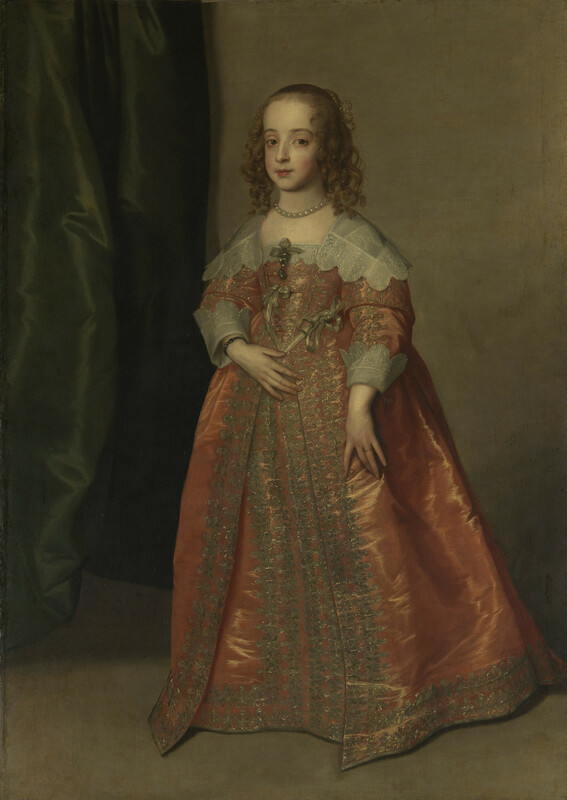 Following her marriage aged just nine years old, the Princess remained in London until February 1642, when she travelled with her mother to Holland to join her husband . She returned to England at the Restoration but died shortly thereafter. Her son, Willem III of Orange, later succeeded her brother Charles II and was crowned King William III of England in 1689. Francis Bacon, Study of Henrietta Moraes Laughing, oil on canvas, 14 x 12 in., painted in 1969. Estimate: $14-18 million. © Christie’s Images Limited 2018. On November 15, Christie’s Post-War and Contemporary Art Evening Sale will be highlighted by Francis Bacon’s Study of Henrietta Moraes Laughing (estimate: $14-18 million). This coveted painting comes from the Collection of S.I. Newhouse, one of the greatest connoisseur art collectors of the 20th Century revered for his innate ability to recognize and acquire only pinnacle works: those that most fully embody the unique vision of their respective makers at the height of their power. Having only had two owners in its 49-year history, counting the artist’s sister, Ianthe Bacon, and Mr. Newhouse, Study of Henrietta Moraes Laughing is now being offered at auction for the very first time. Laughing magnetizes the viewer’s attention in part through the powerful mystery of his sitter’s equivocally closed eyes. The artist did not approach the empty canvas without an idea of what he wanted to paint, but the feelings he wanted to express – about himself, his subject, life, and death – would have been exceptionally difficult to express in paint without his astonishing dexterity and passionate conviction. Often unwell or anxious, Bacon worked alone in his studio, wrestling with his subject matter and the monumental task of capturing the poignancy of mortality in two dimensions. His inspiration, energy, and exhilaration resulted in Study of Henrietta Moraes Laughing. Henrietta Moraes was born Audrey Wendy Abbott, in Simla, India, in 1931. Raised mainly by an abusive grandmother, she never saw her father, who served in the Indian Air Force and deserted the family when her mother was pregnant. In escaping a troubled childhood, Moraes drifted into the London Soho milieu inhabited by Bacon, and modelled for artists. She was thirty-eight when Bacon painted Study of Henrietta Moraes Laughing, with several suicide attempts and three failed marriages behind her. Moraes typified Bacon’s ideal woman-friend – sexually uninhibited, unconventional, spirited if vulnerable, gregarious, and a serious drinker. For her part, Moraes regarded Bacon as a prophet, principally because his paintings of her lying on a bed with a syringe in her arm had foretold the drug addiction to which she later succumbed. Bacon painted Moraes at least twenty-three times (counting each triptych as one work) between 1959 and 1969 but ceased to do so thereafter: Study of Henrietta Moraes Laughing was the final named portrait of her. 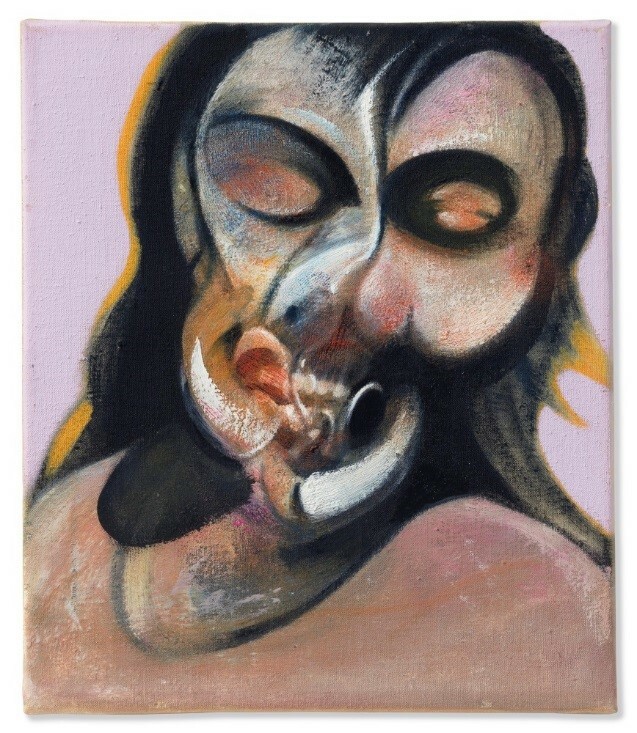 The present painting was known formerly as Study of Henrietta Moraes, 1969; it was exhibited under that title in Bacon’s major retrospectives at the Grand Palais, Paris, in 1971, and at the Tate Gallery in 1985. Beyond identifying body positions (‘Seated’, ‘Lying’, ‘Reclining’) in his paintings, Bacon never appended adjectives to their titles, hoping to discourage anecdotal and narrative interpretations. He reportedly regretted adding the word ‘Laughing’ to the title of his final painting of Moraes and had Marlborough Fine Art remove it from the work’s official title. Moraes’s laugh can definitely be described as enigmatic (her expression invites comparison with a smile), an indication that Leonardo da Vinci’s Mona Lisa was in the back of Bacon’s mind. The sitter’s neckline, too, is similar to that of La Gioconda. Study of Henrietta Moraes Laughing also has affinities with Picasso’s portrait of Dora Maar, Femme assise, robe bleue, 1939, wherein the sitter’s ‘smile’ has also been compared with that of the Mona Lisa. Bacon was probably aware of the coincidence that Maar’s first name was actually Henriette. These correlations, even if speculative, are particularly compelling in the context of Bacon’s theoretical discourse with Picasso. Bacon, who was not close to his family, was very fond of his sister, Ianthe. And while Study of Henrietta Moraes Laughing was likely intended for the artist’s 1971 retrospective at the Grand Palais, Paris, it was also a gift to Ianthe, whom he had visited in South Africa soon after completing the painting – a gesture that gives this work additional special status. The satisfaction that the exhibition at the Grand Palais gave Bacon was intensified by the fact that he was only the second artist to receive the honor in his lifetime; the first was Picasso, in 1966-67. The Paris exhibition was an occasion that manifestly provided the incentive for Bacon to excel, not least in terms of his continuing conversation with Picasso’s art. Ultimately, Picasso was the one twentieth-century artist Bacon respected, and against whom he measured himself. Such were the risks Bacon took, technically as well as conceptually, that it was inevitable not all his paintings would succeed or ‘come off’, as he put it. He approached the blank canvas with a mixture of confidence and apprehension, and however strong his conviction may have been at the moment he began to apply the paint, he would recount – almost with surprise, as if he had been assisted by a miracle of outside intervention – that certain paintings had ‘come off’. He was referring to the gamble he took in the act of painting, one that relied, as he habitually insisted, on ‘chance’ or ‘accident’. His risk paid off with Study of Henrietta Moraes Laughing. On a canvas of relatively small dimensions such as this, the breadth and vigor of the paintwork on his large canvases would have been inappropriately over-scaled. Yet the brushstrokes conspicuously exhibit energy and dynamism, evinced in the blending and smearing of paint across the ‘nose’ and the virtuoso application of wet pigment pressed onto fabric above the teeth and across the left eye, a non-signifying, anti-verisimilitude strategy. The flickering paint simultaneously evokes the aura of a vivid memory – contemplative, almost melancholic – and a factual presence: Study of Henrietta Moraes Laughing is metaphorically alive, before us. The top lot of the sale is a pair of portraits by the Dutch Golden Age painter Frans Hals (1580/5-1666). Dating from 1637, when the artist was at the pinnacle of his fame and fortune, the works depict an unidentified couple thought to be a prosperous Dutch merchant and his wife. While the paintings were on loan to The Fogg Museum at Harvard University, the renowned Hals scholar Seymour Slive observed that they are ‘outstanding, superlative works… in a near miraculous state of preservation.’ Their exceptional condition means that Hals’ fluid brushwork and subtly toned palette can be clearly appreciated. Eric Albada Jelgersma (1939-2018) was just one of several illustrious owners of the Hals pictures, which are said to be the finest pair of portraits by the artist remaining in private hands. During the 19th century they belonged to the family of Count de Thiènnes, who lived in Castle Rumbeke, one of the oldest renaissance castles in Belgium. In the 20th century they passed through the hands of Canadian railroad magnate and pioneering Impressionist collector William Cornelius Van Horne and the American diplomat J. William Middendorf II, before Jelgersma acquired them in 1996 from Robert Noortman, the Dutch art dealer and decade-long director of TEFAF art fair. At that time Albada Jelgersma, a businessman from the south of Holland who had amassed a fortune in the supermarket wholesale industry, was well on his way to establishing his reputation as a connoisseur of 17th-century Dutch and Flemish masterpieces, acquiring works that covered each genre of Golden Age painting. Mr Albada Jelgersma’s collection also includes one of the largest landscapes Jan Brueghel the Elder ever painted on copper (above), and important genre paintings by Gerard Ter Borch, Michiel van Musscher and Dirck Hals, as well as Merry Company, a scene of three young revellers by Judith Leyster (below). This particularly rare work by the greatest female painter of the Dutch Golden Age was painted in 1629 when the artist was just 20 years old, and demonstrates her precocious talent. Other notable highlights include Anthony van Dyck’s monumental painting of Venus and Adonis (below), which is a rare disguised double-portrait of George Villiers, 1st Duke of Buckingham, and his wife Katherine Manners, as the characters from Classical mythology. Painted in 1620, most probably to celebrate the couple's marriage, then rediscovered in 1990, the canvas is one of only three works datable to Van Dyck’s first trip to England — and the only one still in a private collection. In addition, the evening sale features a selection of still life paintings, including a small-scale masterpiece by Ambrosuis Bosschaert the Elder and a monumental Frans Snyders canvas (below). Portrait of Princess Mary (1631–1660), daughter of King Charles I of England, full-length, in a pink dress decorated with silver embroidery and ribbons by Sir Anthony van Dyck, 1641, will be offered from a Distinguished Private Collection in Christie’s Old Masters Evening Sale on 6 December, during Christie’s Classic Week (estimate: £5,000,000-8,000,000). Commissioned to celebrate the crucial alliance between the British crown and the House of Orange, this intimate ad vivum (from life) portrait of Princess Mary, the finest portrait of the type, is remarkable for its royal provenance, the superb quality of its draughtsmanship and its exceptional condition. It is one of the most important European Royal Portraits to come to auction for a generation. The painting will go on public view for the first time, ahead of the auction, at Christie’s Shanghai on 19 until 21 September, later touring to New York where it will be on public view from 25 to 30 October and to Hong Kong between 23 and 26 November, ahead of the pre-sale public exhibition in London from 1 to 6 December. Identified by Sir Oliver Millar as one of two portraits commissioned from van Dyck for the court at The Hague, this painting would originally have formed part of the prestigious collection of the Princes of Orange, Stadtholders of the United Provenances of the Netherlands. It would likely have been displayed in one of their principal palaces, possibly at Binnenhof Palace in The Hague, where Princess Mary lived with her husband William, alongside works by many of the principal Dutch and Flemish painters of the seventeenth century. In July 1632, van Dyck was appointed ‘Principal Painter in Ordinary to their Majesties’ by King Charles I of England. A passionate collector and patron, the King had long hoped to attract a painter of such exceptional status and renown to his service, and found in van Dyck an artist not only capable of fulfilling his desire for magnificent portraits and paintings, but also one who shared his tastes, especially for Venetian pictures. The style, refinement and brilliance of van Dyck’s portraits was unprecedented in England; the artist instilled in his sitters a new sense of vitality and movement and his bravura technique allowed him to enliven the entire surface of his works with light, assured dashes of paint, as exemplified in the present portrait. Van Dyck first painted the sitter in the weeks immediately following his arrival in London in 1632, when the young Princess Royal was shown with her parents, King Charles I and Queen Henrietta Maria, and elder brother, the future King Charles II. The monumental group portrait, known as ‘The Greate Peece’, dominated the King’s Long Gallery in the Palace of Whitehall (The Royal Collection). The earliest single portraits of Princess Mary, which show her full-length in a blue dress, with her hands linked together across her stomach – a pose that echoes van Dyck’s earlier portraits of her mother – were painted in or before 1637, and are now in the Museum of Fine Arts, Boston, and at Hampton Court. Four years later, she sat again to van Dyck with her fifteen-year-old husband, Prince William of Orange, for the double portrait now in the Rijksmuseum, Amsterdam, as well as for the present work. In both the present work and in the Rijksmuseum double portrait, Mary is shown wearing her wedding ring and the large diamond brooch given to her by her husband on 3 May 1641, the day after their marriage. Her spectacular coral gown, decorated with silver thread trim along its border, is thought to be similar to that worn for her wedding, rather than the cloth of silver-gold she wears in the Rijksmuseum picture. The apparent weight of the fabric, falling in broad, heavy folds, along with the bright highlights along the creases, suggest the fabric may have been cloth of silver. Shimmering highlights, applied in swift, cross-hatched strokes, were used as a form of shorthand by artists, mimicking the lustre of metallic threads as the textile caught the light. In accordance with the fashion of the period, her gown is open down the front, revealing a stiffened stomacher across the chest and a matching skirt beneath. The ribbons, which would at one time have been functional, lacing the skirt and stomacher to the bodice, were applied purely as adornment. One ribbon, however has been pinned or stitched flat to disguise the seam between the bodice and skirt. Details such as the Princess’s brooch, the string of pearls and ribbons on her shimmering dress are rendered with remarkable precision and delicacy, characteristics that defined the artist’s finest late works. Princess Mary was born on 4 November 1631 at St. James’s Palace, the eldest daughter of King Charles I and Queen Henrietta Maria. She was baptized on the same day by William Laud, Bishop of London. On 2 May 1641, at the age of nine, she was married to William II, son of Frederick Henry, Prince of Orange and Amalia von Solms, at the Chapel Royal, Whitehall Palace. Mary remained in England for a year after the marriage, eventually following her husband to Holland in 1642, accompanied by her mother and a train of four hundred courtiers. In March 1647, William II succeeded his father as Stadholder of the Dutch Republic and Mary became Princess of Orange. Her new position at court, however, caused conflict with her mother-in-law. The ill health which Frederick Henry had suffered between 1640 and his death in 1647 had meant that Amalia had effectively ruled as Regent and Stadtholder during this time. Mary’s appearance at court seems to have represented something of a challenge to her mother-in-law, with one of Mary’s ladies allegedly saying that ‘it was time the princess should run the country’, since Amalia had done so for so long. In November 1650, following his failed attempt to capture Amsterdam from his political opponents, William II died of smallpox. Eight days later, Mary gave birth to a son, the future William III of England. His baptism saw the rivalry between Mary and Amalia erupt once again: despite Mary’s desire to christen her child Charles, in honour of her father, Amalia insisted that he be called William. Mary’s position in Holland became increasingly precarious during her widowhood. She was obliged to share the guardianship of her infant son and the Regency of Holland with Amalia, and her uncle-in-law Frederick William, Elector of Brandenburg. Amalia was reported to be ‘hateful of all things English’ and Mary’s continuous support of the Royalist cause in England provoked considerable hostility at court. This was no doubt exacerbated by her brothers, the Prince of Wales and the Duke of York, who had come to The Hague in 1648 and 1649, where they borrowed large sums of money from her husband. Indeed, after the Anglo-Dutch war, which had begun in 1652, was concluded by a peace treaty in May 1654, all ‘enemies’ of Parliamentarian England were banned from the Netherlands, thus forbidding Mary to welcome her brothers on Dutch soil again. After the Restoration of Charles II to the English throne in 1660, Mary’s position changed dramatically for the better in the Netherlands. She returned to her homeland in September of Charles’ coronation year, where, after a short illness with smallpox, she died at Whitehall on 24 December. Sotheby’s is honored to announce that two Modern masterworks recently restituted to the heirs of art-world luminary Alfred Flechtheim will highlight theirImpressionist & Modern Art Evening Sale in New York on 12 November 2018. Sotheby’s The Triumph of Color: Important Works from a Private European Collection in theauctions of Impressionist & Modern Art this November in New York. Put together primarily in the 1970s and ‘80s, the collection today represents one of the finest assemblages of post-Impressionist and Modern Art in private hands. The collection is defined by three superb masterworks by Wassily Kandinsky and rare works by the key protagonists of Fauvism and German Expressionism. Several of the paintings were loaned to the Courtauld Institute of Art in London for over fifteen years, where they provided a unique display of works from the Fauve movement, the Expressionists and the route to Abstraction in the early-20th century. Helena Newman, Head of Sotheby’s Worldwide Impressionist & Modern Art Department, commented: “Infused with an intensity of color and expression, this collection of works provides a rare and exciting opportunity to acquire several exceptional examples of early-20th Century Art. It is unprecedented for three major paintings by Kandinsky, each from a key moment in the artist’s creativity, to appear at auction together, and complemented by stunning examples by the Fauves and the German Expressionists, the collection encapsulates the triumph of color in art at the start of the 20th century.’’The three major paintings by Wassily Kandinsky chart the artist’s development across four decadesfrom the earliest successes to his greatest achievements. 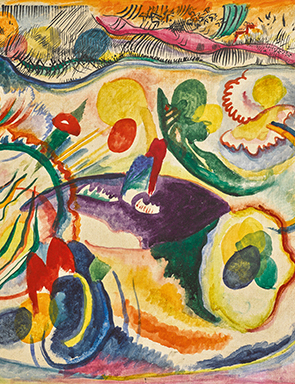 Wassily Kandinsky, Zum Thema Jüngstes Gericht (detail). Painted in 1913. Estimate $22/35 million. Courtesy Sotheby's. 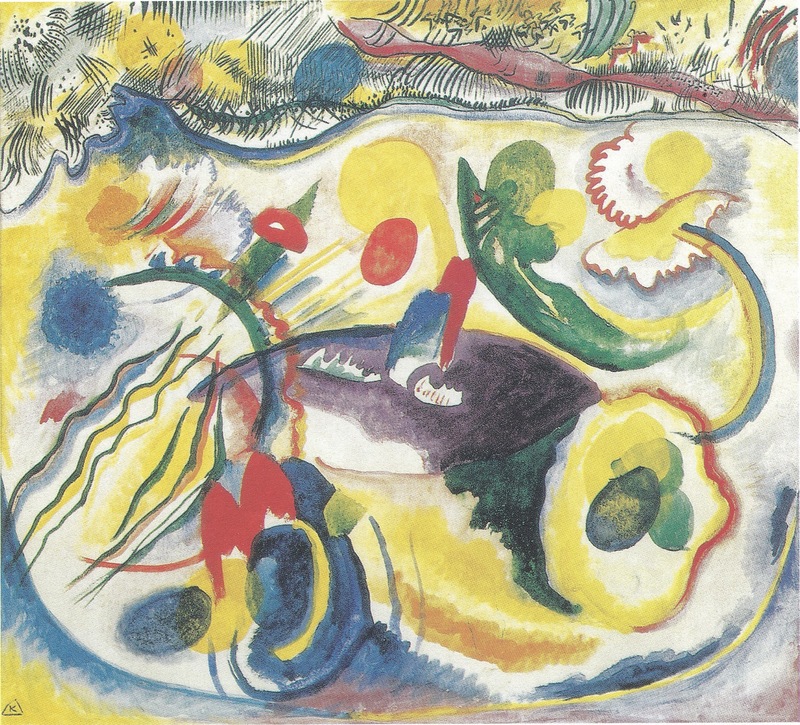 The group is led by one of the last 1913 oil paintings left in private hands, Zum Thema Jüngstes Gericht, a unique composition from this prime year of Kandinsky’s career, during which he reached the summit of his path to Abstraction (estimate $22/35 million). 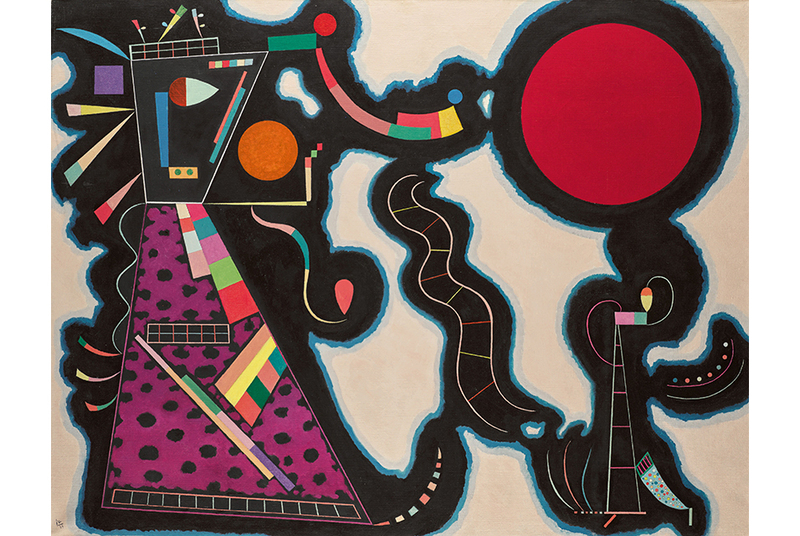 Wassily Kandinsky, Le rond rogue. Painted in 1939. Estimate $18/25 million. Courtesy Sotheby's. A stunning composition from the artist’s Paris period, painted in 1939, Le rond rouge is an exceptional large-format oil on canvas dating from the exhilarating years he spent in France (estimate $18/25 million). The core of the collection has always been works by the Fauves, including three outstanding canvases by Maurice de Vlaminck. Paysage au bois mort (estimate $12/18 million), Pêcheur à Chatou (estimate $9/14 million) and Nu couché (estimate $2/3 million) represent the full spectrum of Vlaminck’s greatest achievements. Executed in 1905 and 1906 at the height of the Fauve movement, the three works boast remarkable, thickly-painted surfaces and vivid palettes. Further highlights include exceptional works by some of the key artists of the German Expressionist movement, including Alexej von Jawlensky, Max Pechstein, August Macke and Heinrich Campendonk. Sotheby’s will offer 33 works in total from the collection across their Evening and Day Sales of Impressionist & Modern Art in New York on 12 & 13 November, together estimated to sell for in excess of $90 million. Highlights are now on view in their London galleries as part of Frieze week exhibitions, and will travel to Hong Kong this fall, before returning to New York for the full viewing of Sotheby’s Impressionist & Modern and Contemporary Art auctions beginning 2 November. 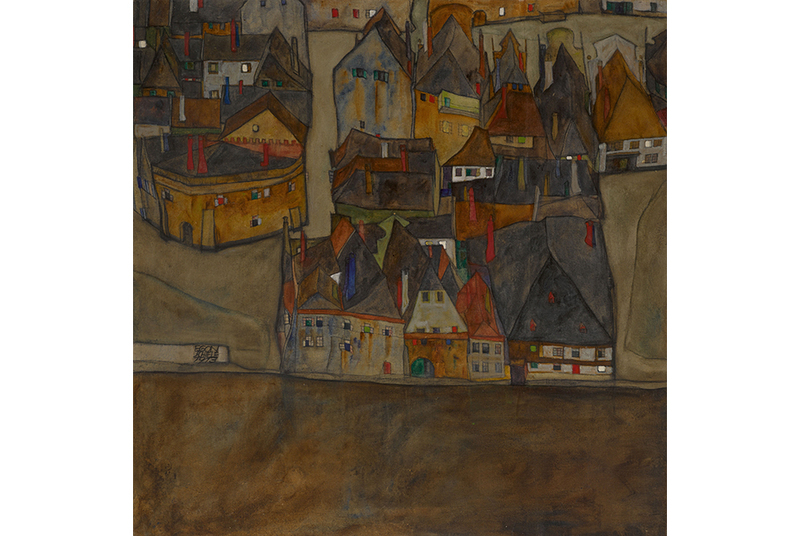 Egon Schiele, Dämmernde Stadt (Die Kleine Stadt II) (City in Twilight (The Small City II)) signed Egon Schiele and dated 1913 (centre left) oil on canvas 35 5/8 by 35 1/2in. Painted circa 1913. Estimate $12/18 million. Courtesy Sotheby's. Managing Director of Sotheby’s Austria,initiated a dialogue between the family and the present owners that has ultimately resulted in the present offering.Dämmernde Stadt is now on public view in Sotheby's London galleries for the first time in nearly 50 years, through 9 October. The landscape will return to our New York headquarters for the full exhibitions of our Impressionist & Modern and Contemporary Art auctions, which open on 2 November. Dämmernde Stadt is estimated to sell for $12/18 million in the 12 November auction. s manifest in myriad characteristics throughout the canvas: the boldly-delineated shapes of buildings’ rooftops; twilight cast in a muted palette; and windows aglow with brilliant, jewel-likecolors reminiscent of Gothic stained-glass. In looking to a Medieval past, Schiele was aligned with a contemporary strain of Gothic revivalism. However he was also attuned with the artistic movements developing concurrently across Europe at the time. His adoption of the high viewpoint and his growing sensitivity to formal relations suggest that he was looking at the work of Post-Impressionist artists, such as Vincent van Gogh and Paul Cézanne. The influence of Klimt’s experiments with form, and the square format in particular, are also apparent in the present work was aligned with a contemporary strain of Gothic revivalism. However he was also attuned with the artistic movements developing concurrently across Europe at the time. His adoption of the high viewpoint and his growing sensitivity to formal relations suggest that he was looking at the work of Post-Impressionist artists, such as Vincent van Gogh and Paul Cézanne. The influence of Klimt’s experiments with form, and the square format in particular, are also apparent in the present work. Christie’s November 11 Impressionist & Modern Art Evening Sale, Including Property from the Collection of Herbert and Adele Klapper. Working with prominent gallerists and auction house specialists, the Klappers steadily acquired important examples of Old Master paintings, Impressionist, and Modern art. The couple carefully curated their assemblage to focus on the very best by artists such as Pablo Picasso, Auguste Rodin, Jean Arp, Claude Monet, Pieter Brueghel the Younger, Paul Cézanne, Pierre-Auguste Renoir, and Edgar Degas. Leading the collection is Claude Monet’s L’escalier à Vétheuil, 1881 ($12-18 million) – pictured left. With its extraordinary profusion of flowers and foliage, this sun-drenched canvas captures the splendor of high summer in Monet’s garden at Vétheuil, a rural hamlet that the artist called home from 1878 until 1881. The staircase at the center of the canvas acts as the compositional anchor for a series of four closely related views of the house and garden, which Monet created during the height of the summer sunshine. The present L’escalier à Vétheuil was most likely the first in the series to be created, its close-up view of the unpopulated steps suggesting that the artist set his easel on the upper terrace to capture the view. The decorative quality of the Vétheuil garden scenes very clearly appealed to the contemporary market. Monet sold all three of the plein air canvases within a year or two of their execution, retaining only the National Gallery studio variant for himself. The first owner of the present version was the Pennsylvania Railroad tycoon Alexander Cassatt, the brother of Impressionist painter Mary Cassatt and a pioneering American collector of the New Painting; the canvas entered his collection around 1883, when Monet’s work was still little known across the Atlantic. In the spring of the same year, Monet and his extended family moved downriver to Giverny, where the artist’s garden as a subject for modern painting would eventually reach its apogee. L’escalier à Vétheuil is the last of the four from the series remaining in private hands: one version hangs in the National Gallery in Washington; D.C., another is in the Norton Simon Museum in Pasadena; and the third was bequeathed by the legendary California businessman, philanthropist and collector, A. Jerrold Perenchio, to the Los Angeles County Museum of Art in 2014. Picasso’s inspiration in creating the pastel Femme accoudée, 1921 ($10-15 million) – pictured on right – was twofold, as he pursued parallel interests in matters of subject and style. The sitter is the artist’s wife Olga, née Khokhlova, whom he met in 1917 while she was a leading dancer in Serge Diaghilev’s Les Ballets Russes. They married the following year, and soon after took an apartment on the rue la Boétie, the new epicenter of the Parisian art trade. Sales were making Picasso a wealthy man. On 4 February 1921, Olga presented her husband, with a son as his first-born, the sole male heir on his side of the Ruiz-Picasso family. The grateful artist celebrated the event in a series of maternity drawings and paintings, while also honoring Olga as a timeless model of graceful, fruitful femininity in figure paintings and portraits. Picasso typically relished the idea of working against the grain of convention, and contravened “the call to order” in the aberrant facial and body proportions he chose to employ in his classical figures. In Femme accoudée, Picasso subjected Olga’s finely boned Slavic features to subtle rococo distortions, widening the space between her eyes while miniaturizing her lips. Present here, too, as a hallmark of Picasso’s classical manner, is the apparent enlargement of the sitter’s arms and hands. Such anti-naturalistic elasticity in plastic forms stems from precedents in Picasso’s earlier figurative styles, as well as his cubist practice, and would prevail throughout his subsequent oeuvre. 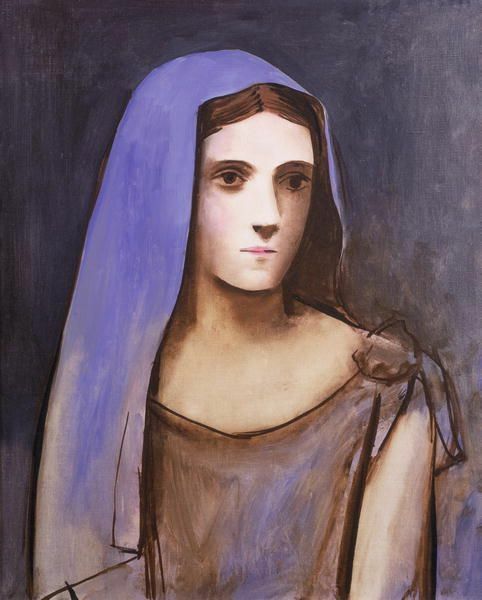 Painted on 28 November 1924, Pablo Picasso’s Buste de femme au voile bleu ($8-12 million) – is among the last of a series of elegant and hauntingly enigmatic neoclassical portraits that the artist painted during the early years of the decade. The sitter’s dark hair, pensive, melancholy gaze, and fine, flawlessly chiseled features immediately bespeak the presence and character of Olga Khokhlova. This painting showcases the culminating, subtle power of expression that Picasso could summon forth while working in the urbane and coolly sensual style of portraiture Olga had inspired in his work. Within months, the artist’s decade-long fascination with classicism would give way to an utterly transformative immersion in the convulsive intensity of the surrealist revolution. Painted in 1896, Danseuse ($6-8 million), is among Henri de Toulouse-Lautrec’s most notable works in the ballet theme. As Lautrec stepped into his studio, he gazed upon his model as she was adjusting the layers of tulle in the ballet tutu she had just put on, in preparation for their working session together. Leaning toward a large mirror, the young woman would have appeared to the artist as if she were bowing to an audience. Her off-center posture, the angled polygon of her shoulders and bent back arms created an impromptu and pictorially perfect contrapposto effect. Quickly appreciating the beauty of the moment, Lautrec would paint his model in precisely this way. The result is this quiet, mysterious painting, a fortuitous success of timing and observation, a sensitive evocation of a lone figure in an intimate, moody ambience. Lautrec’s Danseuse includes in its distinguished provenance the renowned German-born dealer Justin K. Thannhauser, whose collection was given its own wing in The Solomon R. Guggenheim Museum, New York. A subsequent owner was Arthur Murray, a specialist in ball-room dancing, who developed lessons and trained instructors in this activity. In 1938 Murray founded the dance studio franchise that bears his name. David Hockney’s large-scale painting Montcalm Interior with 2 Dogs from 1988, a highly regarded period within the artist’s career, will highlight their Contemporary Art Evening Auction in New York on 14 November 2018. The work comes to auction from the collection of legendary television producer and writer Steven Bochco, who acquired it in 1997, and appears at auction for the first time this fall with an estimate of $9/12 million. “We are thrilled to present this dynamic Los Angeles interior to collectors on the West Coast next week and to bring it to auction for the first time in November. Los Angeles has played a major role in Hockney’s life and work, and this painting is an excellent illustration of that relationship. This piece is also one of the greatest Hockney’s to be kept in a private California collection, out of public view for the last 20 years. It is a particular privilege to offer this painting from the collection of the late Steven Bochco – himself a legend of the entertainment industry and of the city of Los Angeles." Lit with the bright glow of California sunshine, Montcalm Interior with 2 Dogs encapsulates Hockney’s evolution in the tradition of interior painting, while also displaying his unique interpretation of the genre. 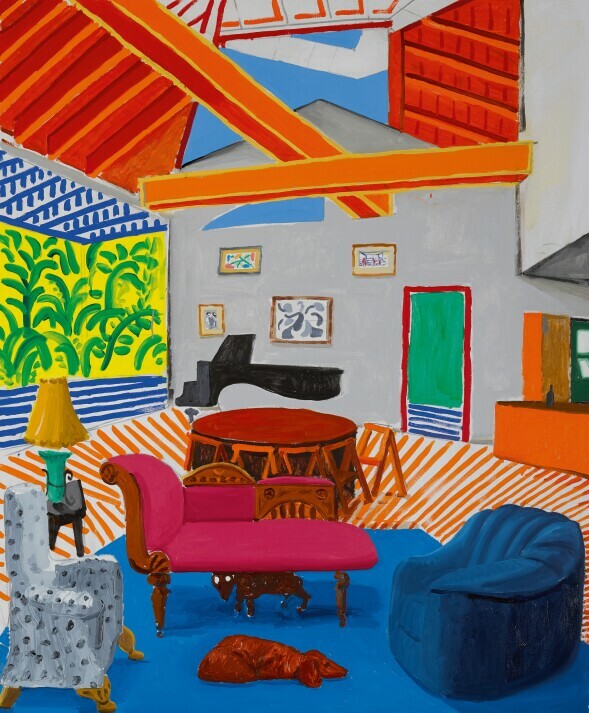 Painted in 1988 – the same year as his first, critically-acclaimed U.S. retrospective at the Los Angeles County Museum of Art – the canvas captures a room within Hockney’s Montcalm Avenue home in Los Angeles, which he purchased in the summer of 1979. Large Interior, Los Angeles, which has been held in the collection of The Metropolitan Museum of Art in New York since 1989. Montcalm Interior with 2 Dogs was featured prominently in the artist’s 1992-93 retrospective organized by Fundación Juan March, Madrid, which traveled to both the Palais des Beaux-Arts, Brussels and the Palau de la Virreina, Barcelona. The work has not been exhibited publicly since. At once highly personalized and deeply rooted in art historical tradition, Montcalm Interior with 2 Dogs exemplifies Hockney’s ability to merge the painterly techniques of the past with his own distinctive, inventive, and remarkably intimate experience of reality. Painting with vivid brushstrokes and vibrant, raw colors that clearly evoke the post-Impressionist masters whom he greatly admired, Hockney flattens space to enhance the emotional and physical immediacy of the viewing experience. In this way, Montcalm Interior with 2 Dogs showcases the rich, saturated color application and deft handling of space that are characteristic of Hockney’s greatest paintings. On 14 November, Sotheby’s will present works by O’Keeffe in a Contemporary Art Evening Auction for the first time: A Street from 1926, one of the most psychologically penetrating paintings from the artist’s rare and distinguished series of New York cityscapes (estimate $12–18 million), and Calla Lilies on Red from 1928, a vibrant depiction of the flower with which O’Keeffe would become synonymous (estimate $8–12 million). Our American Art Auction on 16 November will feature Cottonwood Tree in Spring from 1943, which reveals the profound inspiration O’Keeffe gleaned from the American Southwest (estimate $1.5–2.5 million). 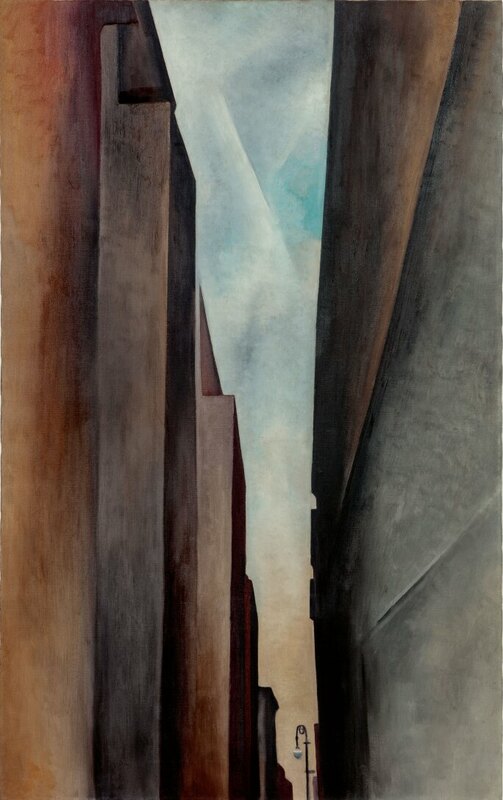 Georgia O'Keeffe, A Street , 1926. Estimate $12,000,000–18,000,000. 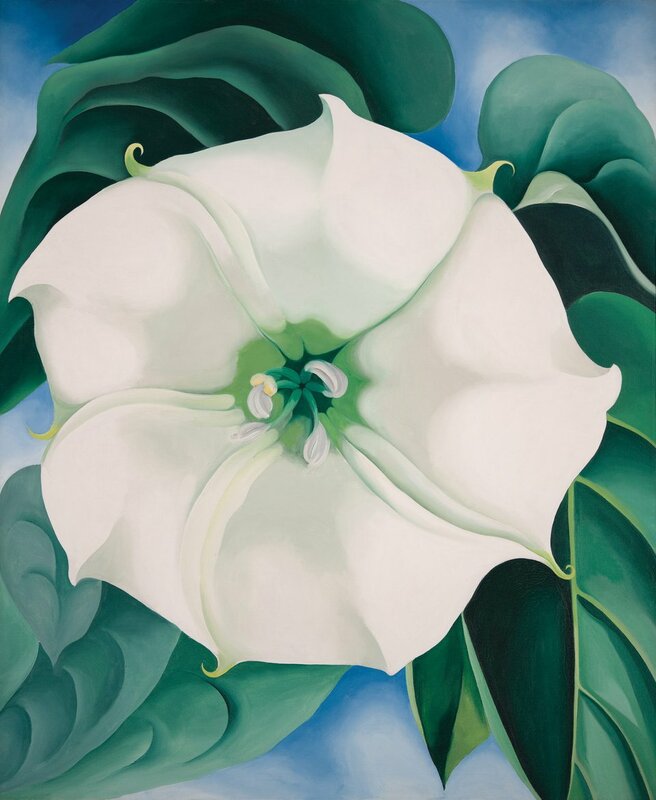 In May 2014, Sotheby’s sold Georgia O’Keeffe’s iconic flower painting Jimson Weed/White Flower No. 1 to benefit the Georgia O’Keeffe Museum’s Acquisitions Fund. The painting achieved a remarkable $44.4 million, setting a world auction record for any work by a female artist that still stands today. Jimson Weed/White Flower No. 1 now resides in the collection of Crystal Bridges Museum of American Art in Bentonville, Arkansas, and was the star of the blockbuster retrospective Georgia O’Keeffe at the Tate Modern and Art Gallery of Ontario in 2016–17. Painted In 1926, A Street is one of the most physically imposing and psychologically penetrating works from the distinguished series of New York cityscapes that Georgia O’Keeffe created between 1925 and 1929. Critics now regard this small but powerful series of some 20 works as standing among the most satisfying, painterly, and memorable of her career. The cityscapes stand as both a personal and universal expression of the ambivalence of urban existence – the simultaneous glorification and condemnation of the overwhelming human and mechanical energy of a city. Georgia O'Keeffe, Calla Lilies on Red , 1928. Estimate $8,000,000–12,000,000. O’Keeffe began her New York life in 1918. Following her marriage to the influential photographer and gallerist Alfred Stieglitz in 1924, the couple moved to an apartment building on East 58th Street. It was here that O’Keeffe began her fascination with the skyscraper, observing the construction of the Shelton Hotel at Lexington Avenue and 49th Street in Midtown Manhattan – a building the couple moved into in 1925. The identifiable buildings from her subsequent cityscapes were all found within walking distance of the Shelton, which the artist often presented as simplified masses – isolated icons of New York’s unique modernity. When O’Keeffe began her cityscapes, Stieglitz cautioned her against what he considered a man’s topic. 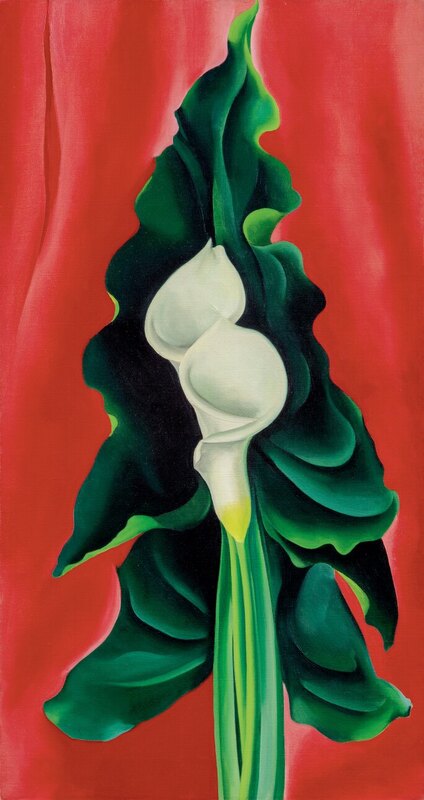 They stood in stark contrast to O’Keeffe’s sinuous abstractions and flowers, and represented a bold challenge to her male contemporaries and critics. The series served as inspiration for Joan Mitchell’s rebellious cityscapes from the early 1950s – among others – which similarly revolt against the stereotypical hyper-masculinity of Abstract Expressionism. Between 1918 and 1932, Georgia O’Keeffe created more than 200 flower paintings. But it was arguably in the calla lily that the artist found her ideal motif, one that provided the perfect synthesis of subject and form that now defines her most celebrated work. O’Keeffe painted Calla Lilies on Red in 1928. She would ultimately depict the calla lily eight times in this period, both in oil and pastel, revisiting the blossom on each occasion with a new viewpoint or altered perspective. In the present work, she emphasizes the verticality of the flower’s delicate form by presenting an elongated picture plane with its sensuous petals at center. She utilizes vibrant hues of red and green, which contrast dramatically the white flower, to imbue the canvas with energy and vitality, and emphasizes the simple elegance of the flower’s curves by reducing extraneous details. Georgia O'Keeffe, Cottonwood Tree in Spring, 1943. Estimate $1,500,000–2,500,000. O’Keeffe started to visit New Mexico regularly in 1929 when, in an effort to escape city life, she left New York to spend the summer there. While the stark simplicity and expansiveness of the desert landscape always strongly appealed to O’Keeffe’s artistic sensibilities, this particular trip proved transformative for her both personally and artistically. Works such as Cottonwood Tree in Spring reveal the profound inspiration O’Keeffe gleaned from the American Southwest. The sublime beauty of the landscape provided a free range for her imagination, and she would continue to investigate its imagery for the remainder of her life, returning almost every summer until 1949 when she made Abiquiu her permanent home. While the artist had always utilized the natural world as the basis for her unique visual language, in New Mexico her art gained an even deeper intimacy and, in works such as Cottonwood Tree in Spring, it transcends a literal study of nature to evoke the spiritual connection she felt with her adopted home.